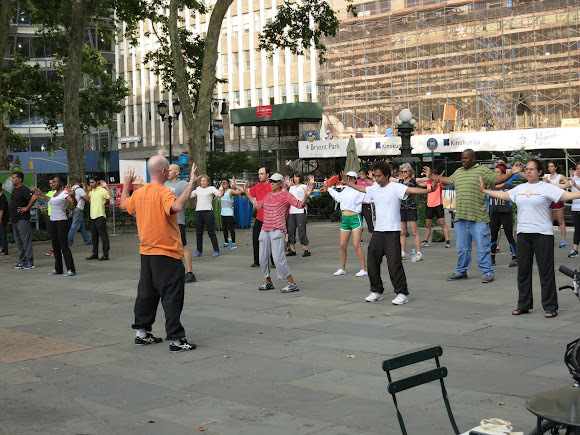 This post from Jeremy Hubbell of CK Chu Tai Chi talks about Eternal Spring, the style of tai chi offered at Bryant Park every Tuesday and Thursday morning in the spring and summer months. "A moving hinge never rusts." For thousands of years, Taoists have been seeking to understand how to live a long and healthy life. They realized that nature, left to its own devices, takes care of itself; your body has tremendous rejuvenating capacity if you allow it the time each day to do so. Health, they found, depends on daily physical movement, deep breathing, and relaxation. This simple notion was captured in the saying, ‘a moving hinge never rusts’. The experimentation with particular routines of movement has led to the evolution of thousands of different kinds of health regimens or ‘chi kung’. This system of movement is one of the treasures China has been sharing with the world for more than a century. In 2015, I wrote about how Grandmaster C.K. Chu developed the Eternal Spring Chi Kung™ program to help people improve their health and enable more people to enter into the richness of Tai Chi Practice. The Tai Chi Chuan Center’s summertime Bryant Park Tai Chi classes are composed of the Eternal Spring routine and the Tai Chi short form. We believe that offering Eternal Spring Classes gives people the necessary opportunity to move their bodies in a way that is self-healing. Bryant Park Tai Chi practitioners reap the benefits of Eternal Spring. Eternal Spring is a Chi Kung routine where breathing (long, deep, small smooth breaths that expand and contract the abdomen) coordinated with particular movements open up the joints and stretch the limbs. This combination of movement and breathing increases the circulation of body fluids, like blood and lymph, as well as energy, like the electricity of the nervous system or the electrical conduction of the fascia. In other words, it improves “chi” flow. Chi is a Chinese term that can take a whole book to explain. But to keep it simple: when we feel good because our posture is correct, our breathing is deep and full, and our body’s blood and lymph is circulating well that is feeling Chi. When we do Eternal Spring, we feel good - we have good chi - and we can relax. For Taoists, relaxation is a physical skill developed and perfected through exercise and correct breathing. Improving your chi though Eternal Spring is the result of relaxing; and the more you relax, the better your chi. Regular practice of Eternal Spring leads to a process of anti-aging where the body becomes more relaxed in general and the body’s breathing becomes deeper as accumulated stresses are released. Grandmaster Chu would say that Eternal Spring is not exercise, it is a daily maintenance program - like brushing your teeth. You use the body everyday, you also need to tune it up everyday. In a Bryant Park Tai Chi the benefits of chi kung are magnified by the setting. Doing Eternal Spring in a group while listening to the water of the fountain, feeling the sun on your face, and immersed in the beauty of Bryant Park can be a deeply rewarding experience. Come try a class with us!